In the past, operation & maintenance (O&M) has been considered as nothing more than the maintenance and inspection operation of equipment, but it is rapidly coming to be utilized as a source of corporate competitiveness. 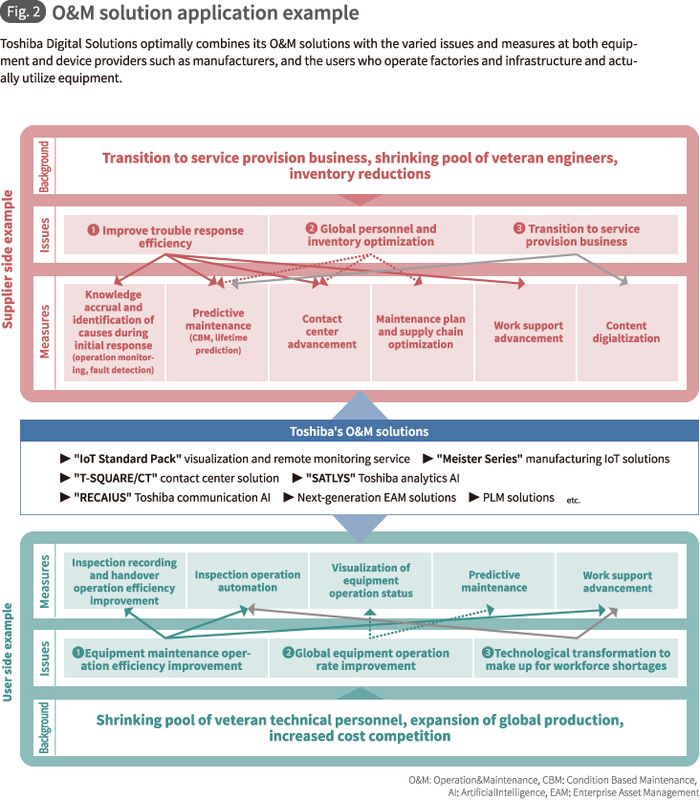 Manufacturing and infrastructure companies now principally face two challenges. The first is how to realize labor-savings and improve equipment operation rates in response to the deterioration of domestic equipment and the labor shortages that are being accelerated by the shrinking and aging population. The second is how to transform O&M processes using digital technologies, especially the internet of things (IoT) and artificial intelligence (AI). In order to tackle these issues, Toshiba Digital Solutions brings about advances in all processes of the O&M cycle, both for the providers of equipment and devices such as manufacturers, and the users of facilities that operate factories or infrastructure with the manufacturing expertise of the Toshiba Group and leading digital technologies. It proposes diverse solutions in the form of Toshiba's O&M solutions, based on SPINEX, Toshiba's IoT architecture. 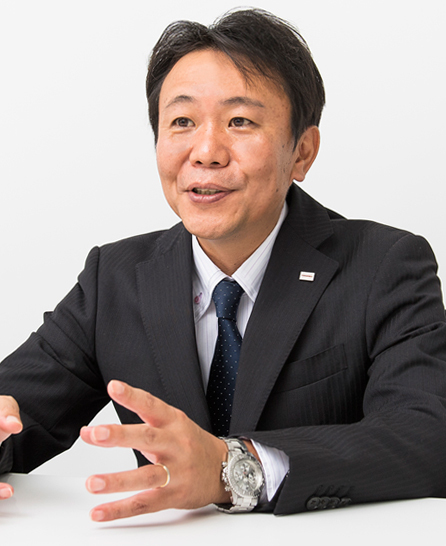 This special feature looks at the changes in the societal environment surrounding O&M and the impact of digitalization, and introduces Toshiba's current solutions. There is an increasingly urgent demand for O&M operation transformation among manufacturing and infrastructure companies, whichever they are suppliers or users of equipment and devices. This is being driven by the rapid changes happening to Japan's social structure. Social infrastructure such as roads, power, water and sewerage are mission-critical elements that can have severe impacts on people's lives and lifestyles once failure or stoppage of the facilities occur. The same is true for factory production equipment, which is exposed to competition with other global companies. If a machine tool fails and production lines are stopped, it could produce tremendous damages that would harm the entire business of the company that owned the factory. In order to provide long-term maintenance and management of facilities and restore rapidly in the event of a failure, device and equipment providers are providing more advanced maintenance services, and users are allocating a certain number of dedicated experts to carry out O&M operations. These efforts are facing what are becoming major obstacles: the shrinking of the workforce as the result of Japan's shrinking and aging population, and the globalization of operation sites. One authoritative organization estimates that by 2030 the working-age population in Japan will have shrunk by over seven million people. This means there will be roughly 10% fewer workers in comparison to the figures for 2015, and it is worried that this will have a major impact on corporate activities. For both production and infrastructure facilities, O&M often encompasses optimized, special-order devices and unreplaceable equipment. The decisions based on technologies and experts’ knowledge acquired by experiences at the sites contribute to facility maintenance and management, failure avoidance, and the improvement of operation rates at global sites. There is a rising need to convert the implicit knowledge regarding inspection, maintenance and operation, which have become highly reliant on the capabilities of individuals, into codified knowledge, and to create new O&M systems that provide both labor-saving and operation rate improvements in a higher level. Hopes are high for the potential for advanced digital technologies, led by the IoT and AI, to tackle these issues. In factories and social infrastructure, ICT has assisted in facility maintenance, work efficiency improvement and operation plan optimization. The introduction of the IoT and AI can further enhance these measures, sweeping away concerns regarding the aging of society and workforce shortages, and dramatically improving the outcomes at the global scale. For example, digitalization can be used to continuously remotely monitor the massive amounts of time-series data received by sensors through the IoT, analyze them with AI, and improve maintenance efficiency. Furthermore, through acquiring skilled experts’ operation data and associating them with sensor data, it enables to digitalize implicit knowledge such as which parts will fail or which conditions lead to problems, and to evolve it into advanced preventive maintenance. This not only makes it possible to avoid sudden shutdowns of production lines, but also, by constantly keeping aware of device conditions, can contribute to maintenance component cost reductions. These are not the only impacts of digitalization. The introduction of the IoT and AI at O&M sites is becoming the driving force toward transformations of the business models of suppliers such as manufacturers of devices and equipment. Comprehensive analysis of product usage status, conditions when problems occurred and individual site environments, make it possible not only to improve product functions based on the results, but to optimize product performance and reduce energy costs. They enable improvements throughout product lifecycles, as well as creation of greater customer value. At this stage, products become media that provide value, and O&M changes from a cost of product maintenance and inspection into a service that creates value. Suppliers remotely replace software and change the settings, to respond to the needs or to individual environmental changes, based on the device and equipment usage status information. By assuring the stable performance, it comes possible to switch business models to pay-per-use billing based on usage amounts or number of uses, or even to performance-based billing reflecting cost savings or any positive outcomes. These service business models, in which products, maintenance and operation are offered as one, are called "as a service" or "subscription" business models, and have the potential not only to free suppliers from being reliant on device sales, but also to create a platform that fosters close-knit, long-term relationships with customers. Toshiba Digital Solutions is one of the first companies to realize the possibilities of digitalization for O&M. Its advanced IoT technologies enable to connect sensors and devices, collect, store, analyze and utilize data in various facilities – factories, plants, water treatment facilities, building facilities, and more –. Toshiba Digital Solutions has built up an extensive track record of shortening failure detection time and increasing the efficiency of inspection, maintenance and operation. This has been achieved through the experience Toshiba Group has accrued ensuring safety and security as a manufacturer of elevators, electric facilities and industrial equipment, and through its O&M knowledge as a user of devices and equipment in its factories and plants as well. Moreover, it is a unique company that can provide digital solutions combining the latest digital technologies with its own implementation experiences. The know-how it has developed through these activities is systematically integrated based on Toshiba's "SPINEX" IoT architecture. Advanced technologies such as IoT, cloud, and AI technologies are used appropriately to offer O&M solutions that provide powerful support for O&M digital transformation. O&M can broadly be divided into two types of business cycles. The one is the business cycle of suppliers as manufacturers, and the other is the business cycle of users, who operate factories and plants (Fig. 1). For machines, human and other resources to be optimized in these cycles, there are five processes respectively: monitoring, collection and detection -> integration and analysis -> forecasting and prediction -> planning -> implementation and operation. For example, a machine tool manufacturer – a product supplier – will be able to issue announcements recommending the replacement of parts before they fail, or to propose methods for reducing power consumption by collecting and analyzing operation data and parts usage data from machines installed at customer sites. On the user side, the status and condition of delivered machine tools can be continuously monitored not only to improve equipment operation rates, but also to reduce maintenance costs by switching from time-based maintenance (TBM), in which maintenance like periodical inspection is performed at fixed intervals, to condition-based maintenance (CBM). 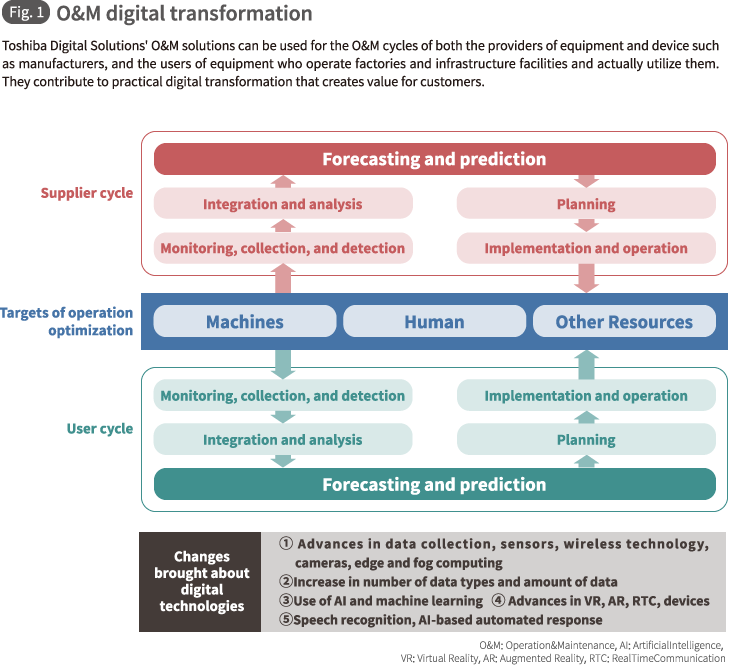 The solutions we provide can be used for both of these O&M cycles, contributing to practical digital transformation that creates value for suppliers and users alike. Optimal solutions are provided by combining operation systems with various technologies, such as ‘Digital Twin,’ which replicate site activities in digital space in real time; ‘Edge Computing,’ which performs real time data processing at edges and collaborative processing with cloud and fog servers; and Toshiba's communication AI "RECAIUS" and analytics AI "SATLYS". For factory O&M, we provide the manufacturing IoT solutions "Meister Series" that offer consistent support for data utilization, including IoT data collection, storage and visualization. We also provides "IoT Standard Pack," which support remote monitoring and operation for equipment manufacturers in cloud environments, and have begun to provide the new solutions such as "Meister Digital Field Work*" and "Meister AR Suite*," which crystallize the knowledge and skills of veteran engineers in the form of digital information, using this data to support the activities of site workers. * Meister Digital Field Work is introduced in detail in #03 and Meister AR Suite in #04. In order for companies to optimize their entire O&M cycles, not only the latest digital solutions, but also the optimized integration with their operation systems are necessary. We provide total solutions integrated with enterprise asset management (EAM) systems that provide overall coverage for equipment maintenance, call center systems that serve as customer contact points, maintenance component procurement and supply chains. * The corporate names, organization names, job titles and other names and titles appearing in this article are those as of October 2018. Transforming the workstyles of site operators involved in asset management Aggregating inspection and maintenance information in mobile devices "Meister Digital Field Work"